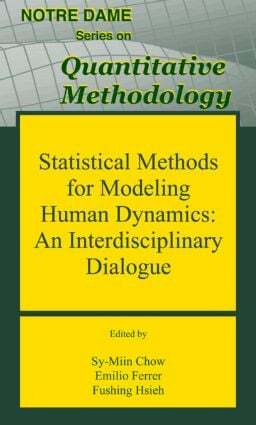 This interdisciplinary volume features contributions from researchers in the fields of psychology, neuroscience, statistics, computer science, and physics. State-of-the-art techniques and applications used to analyze data obtained from studies in cognition, emotion, and electrophysiology are reviewed along with techniques for modeling in real time and for examining lifespan cognitive changes, for conceptualizing change using item response, nonparametric and hierarchical models, and control theory-inspired techniques for deriving diagnoses in medical and psychotherapeutic settings. The syntax for running the analyses presented in the book is provided on the Psychology Press site. Most of the programs are written in R while others are for Matlab, SAS, Win-BUGS, and DyFA. Techniques used to analyze reaction time data. Each chapter features an introductory overview of the techniques needed to understand the chapter, a summary, and numerous examples. Each self-contained chapter can be read on its own and in any order. Divided into three major sections, the book examines techniques for examining within-person derivations in change patterns, intra-individual change, and inter-individual differences in change and interpersonal dynamics. Intended for advanced students and researchers, this book will appeal to those interested in applying state-of-the-art dynamic modeling techniques to the the study of neurological, developmental, cognitive, and social/personality psychology, as well as neuroscience, computer science, and engineering.